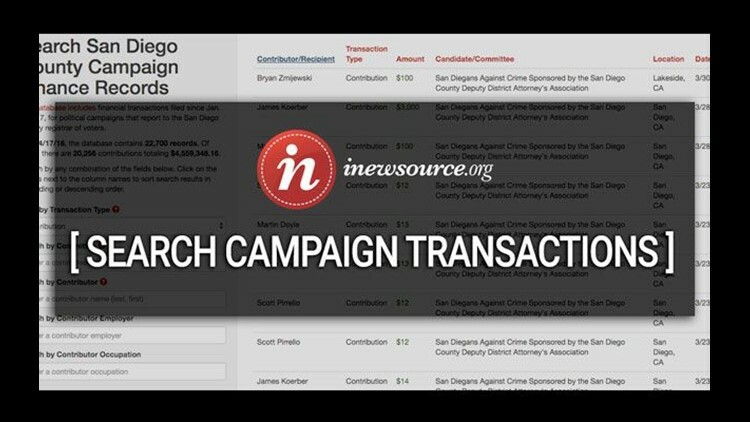 We’ve launched our San Diego County campaign finance database, which we hope will make it easier for the public to understand who is funding political campaigns. Using records from the county registrar of voters’ website, this inewsource database allows users to search contributions, expenditures, loans and debts for political campaigns that have to file financial reports with the county. This campaign finance database is a work-in-progress, and we’re counting on you — the users — to tell us what you like, what you don’t like, what’s broken and what you’d like to see added. Please don’t hesitate to email data@inewsource.org with suggestions. That means it includes campaign finance records for Board of Supervisors, district attorney, sheriff, school boards and special districts. Since 2016, this campaign finance data has been locked in a user-unfriendly system on the registrar’s website. (Before that, it was basically only available on paper forms.) The county’s data portal made the information confusing enough that only the most dogged and tech-literate individuals could understand it. Until now. We have basic instructions on the database’s main page, but in the interest of helping people as much as possible, here’s a detailed guide to using the database. We’ve also written a (relatively) quick primer on campaign finance that we hope will help you better understand the results you get as you use the database. The first thing to understand when you’re searching our data is that there are four different types of transactions included in the results: contributions (donations to a campaign), expenditures (spending by a campaign), debts (money a campaign owes to others) and loans (money received by a campaign that it has to pay back). Committees do not have to report the details of contributions or expenditures under $100, so those are not included in our database. If you only want to see one kind of transaction, you can filter the transaction type on the left side of the database in the search box. For example, if you only want to see how much money campaigns have raised, click on the “Contributions” filter. The database allows you to search by the name of a candidate/committee and by the name of the contributor or recipient of a campaign’s money. By default, the database will sort results by date, with the latest contribution first. Click on any of the buttons next to the other column headers to sort results by that column in ascending or descending order. Click on the amount of a transaction for detailed information, such as a donor’s occupation and employer or a description of the campaign expenditure. Each transaction that a campaign reports to the county includes the name of the entity on the other side of the transaction — the person or group receiving money from the campaign or giving money to the campaign. For contributions, these are the names of donors. For expenditures, these are the people and groups campaigns are paying. Because people aren’t always consistent in how they enter their names when they donate money, you will have the best results searching by an individual's last name, especially if the person has an unusual or uncommon last name. Likewise, if you’re searching for an organization such as a business, union or political action committee, you might have better results by entering a portion of the organization's name (e.g. "Chamber of Commerce" instead of “San Diego Regional Chamber of Commerce”). Political candidates form committees to raise and spend money while running for office. San Diego County's campaign laws require these “candidate-controlled committees” (more on these in the next section) include the candidate’s name, office sought and election year, so all of those are valid ways to search. For example, if you want to see data on all of the district attorney candidates, enter “District Attorney” in the candidate/committee search field and you’ll get all of the contributions to the candidates. If you are searching for a candidate, you will have the best results if you enter the person’s last name into the search field. Sometimes candidates’ first names are not included in their committee names. It’s important to remember that candidate-controlled committees aren’t the only way that money is given to help candidates for office. Independent committees — the super PACs of local politics — also can run ads to support or oppose candidates(again, more on these in the next section). Campaign committees have to record the locations of the people and groups they’re receiving money from and giving money to. The “Location” column contains data in a “City, STATE” format, so search by a city’s name to get results. Remember that these locations might be outside California. How up to date is our data? inewsource will regularly update the county campaign finance database, but it’s important to know that different kinds of campaign finance records are reported at different times. Our database is only as updated as the reports are. Campaigns have to file four different kinds of reports that we use in our database: Form 450, Form 460, Form 496 and Form 497. Form 460s are the most comprehensive reports that list every contribution from a donor and expense by the campaign of at least $100. They also include loans a campaign has taken and debts a campaign owes. Form 460s are filed every six months in odd-numbered years and at scheduled deadlines before and after primary and general elections. Form 450s are filed by committees that aren’t controlled by candidates, have not received any donations or other payments over $100 this election cycle and have no loans or debts. Committees filing Form 450s will still provide detailed information on their spending. They are filed at the same scheduled deadlines as Form 460s. Form 497s and Form 496s are sometimes called the “24-hour reports.” These forms are more barebone but also much more timely. In the 90 days before an election (primary or general), a committee must file a Form 496 within 24 hours of making an expenditure of at least $1,000 in that election cycle. They also must file a Form 497 within 24 hours of receiving a contribution from a donor who has given at least $1,000 in that election cycle. These forms are typically not filed outside of those 90-day windows. Though Form 460s and Form 450s are more detailed reports, the 24-hour reports provide information on big spending and donations closer to the election. For example, the last Form 460 filing deadline before the 2018 primary election is May 24. Between then and the primary election on June 5, the only financial reports being filed are the 24-hour reports. There are two main types of committees in San Diego’s campaign ecosystem: candidate-controlled committees and independent committees. Here’s a brief rundown of how they can raise money and what they can do with that money. May accept contributions from individuals (and sole proprietorships and personal/family trusts), and political party committees. Are bound by contribution limits. May make contributions to independent committees. May make independent expenditures to support ballot measures. These are about as plain vanilla as it gets in San Diego County politics. Candidate-controlled committees are run by a candidate and function as the primary vehicle for the person’s campaign to receive contributions and make expenditures. Such committees are bound by contribution limits adjusted every other year to keep up with inflation. For individuals (including sole proprietorships) who want to donate to a county candidate’s campaign, the limit for the 2017-18 election cycle is $800. For political parties that want to donate to a county candidate’s campaign, the limits for the 2017-18 election cycle are $25,950 for Board of Supervisors and $51,850 for most countywide offices, including district attorney and sheriff. All of these limits are per contributor and per election. Plus, the primary and general elections count as separate votes. This means an individual could give $800 to a sheriff candidate to be used in the primary and another $800 to that candidate to be used in the general. Candidates may accept contributions earmarked for the general election during the primary election campaign but cannot use those contributions until the general election. Candidates may contribute unlimited personal funds to their campaign committees. These committees may make contributions to independent committees, but not for the purpose of facilitating independent expenditures for or against other county candidates. They also cannot make contributions to other candidate-controlled committees. Examples of candidate-controlled committees in the 2017-18 election cycle are Bonnie Dumanis for Supervisor 2018, Nathan Fletcher for Supervisor 2018, Re-Elect Sheriff Gore 2018 and Jones-Wright for District Attorney 2018. May accept contributions from any source, including individuals, corporations, unions and other political committees. Are not bound by contribution limits. In general may only make contributions to other independent committees (political party committees are an exception). Think of these as the super PACs of the San Diego County political world. Independent committees include political party committees, ballot measure committees, committees established to support or oppose a single candidate or a group of candidates in the same election and committees that are established to support or oppose a variety of candidates across multiple elections (like political parties) and others. Regardless of their purpose, all independent committees operate under similar rules and all are run separately from any candidate-controlled committee. With the exception of political parties, they cannot contribute to candidate-controlled committees. They can, however, spend unlimited amounts of money to support and oppose candidates by buying television, radio or online advertising, and by conducting polls and mailing fliers with pro- or anti-candidate messaging. They are prohibited from coordinating any of these activities with candidates, which is why they are called “independent expenditures.” These committees may make unlimited contributions to other independent committees. With the exception of independent expenditure committees, such committees are not bound by contribution limits. They may accept contributions of unlimited size from any source (individuals, corporations, unions, etc.). An independent expenditure committee is an individual or entity (like a corporation or nonprofit) that entirely self-funds political activities, namely making independent expenditures. By definition, an independent expenditure committee does not accept contributions from sources other than a parent organization. Examples of independent committees in the 2017-18 election cycle are San Diego Regional Chamber of Commerce PAC and San Diegans Against Crime Sponsored by the San Diego County District Attorney’s Association. For more information on campaign finance rules, go to the California Fair Political Practices Commission website. Editor’s note: This article is based on prior research and writing by former inewsource data reporter Joe Yerardi. See anything interesting? Share it with us through our Facebook or Twitter accounts. inewsource is an independent, investigative journalism nonprofit supported by foundations, philanthropists and viewers like you. Read additional stories on the inewsource.org website.